The Youngstown State volleyball team outlasted Bucknell in a marathon third set and cruised in the fourth to beat the Bison 3-1 and earn the Bucknell Invitational championship. The set scores were 25-20, 22-25, 31-29, 25-13. The Penguins finished off their 3-0 weekend against Bucknell after beating NJIT in four sets earlier on Saturday. The Bison won their first two matches of the tournament, which set the stage for a winner-take-all match to end the weekend. Sophomore outside hitter Margaux Thompson (Valley City, Ohio), had a match-high 20 kills, and she added 17 digs for her third double-double of the weekend. She was named the tournament's Most Valuable Player, and she was joined on the all-tournament team by Alexia Byrnes (Lisle, Ill.) and Aleah Hughes (Berlin Center, Ohio). Byrnes had 33 assists and 16 digs, and Hughes finished with 16 kills and 18 digs. Ten of those 16 kills came in the third set that turned the match in Youngstown State's favor. "I'm glad to see the team's growth throughout the weekend in all parts of the game," YSU head coach Aline Scott said. "Particularly in this last match, our defense came alive and kept us in the game when things got tough. We talk about defensive relentlessness daily, and today it was key. I'm happy for our group because they showed a lot of discipline, fight and heart today." 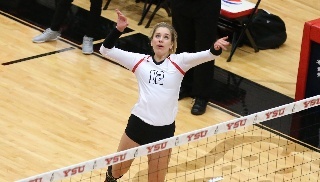 YSU never trailed in the opening set, and it led from 5-4 until its 25-20 win. The Penguins then led 20-16 in the second set before Bucknell scored five straight points as part of a 9-2 run that resulted in a 25-22 win that evened the match. The Bison jumped out to a 9-4 lead after scoring eight straight points in the third set, but YSU hung tough and battled back to get within one twice and ultimately catching the Bison at 15-15. The Penguins took the lead at 22-21 on a Valor Haggerty kill, and the score remained within a point until a Bucknell attack error ended the set at 31-29. That came on YSU's fifth set point opportunity. YSU scored six of the first seven points in the fourth set and pulled away to take a 15-4 lead behind Morgan Tippie's serve. The lead was at least nine the rest of the match. Youngstown State will play four matches in the area next week, starting with a contest on Tuesday at Kent State. The Penguins will then play twice on Friday and once on Saturday at the Duquesne Invitational.